SAN JOSE, CA--(Marketwire - Feb 6, 2012) - Novellus Systems (NASDAQ: NVLS) today announced the addition of the VECTOR Strata to the company's dielectric product offerings. VECTOR Strata has been developed specifically for high-volume manufacturing of vertically integrated memory (VIM) Flash devices. This is the second Novellus product announced in recent months for this emerging market, following the ALTUS® ExtremeFill tungsten CVD system introduced in July 2011. VECTOR Strata employs innovative technology designed to deliver ultra-smooth films with exceptional defect performance, enabling in-situ deposition of the alternating silicon-based layers used in the formation of the VIM structure. The VECTOR's multi-station sequential processing (MSSP) architecture provides a unique solution to the cost of manufacturing for VIM that will allow acceleration of the technology into high volume production. As the industry moves towards sub-20 nm nodes, traditional planar NAND flash devices are approaching scaling limitations. At these smaller device geometries, the close packing of memory cells results in a significant increase in parasitic inter-wire capacitance that in turn leads to increased cross talk and power consumption. Additionally, the closer proximity of adjacent memory cells causes shifts in the threshold value of a memory cell while an adjoining cell is being programmed, leading to memory disturbance. Finally, at sub-20 nm dimensions the number of electrons in the floating gate of a traditional planar NAND flash device is significantly reduced, to the point where multiple bits per cell are no longer possible and thus the extendibility of the technology becomes limited. In order to address these challenges, NAND flash device manufacturers are aggressively pursuing different types of 3D VIM designs. Though the specific materials required in each of these structures are different, all of these approaches require alternating layers of silicon-based films. Each pair of alternating layers is used to form a memory cell, and up to 64 pairs of alternating layers are expected to be used in the formation of a VIM chip. Using this processing approach, underlying film roughness and defects within each layer can potentially be magnified while building up the VIM structure. To control these problems and ensure high yields, exceptional nano-particle control (required to reduce defectivity) and ultra-smooth film deposition (required to avoid word line edge variability, and hence word line performance variations) are both production requirements. The new VECTOR Strata system has been designed to meet the stringent roughness and defectivity standards necessary to manufacture these next-generation VIM devices. Figure 1 shows a) VECTOR Strata's ultra-smooth films deposited in an alternating layer film stack in comparison to b) conventional PECVD films. The system also employs several innovative features that optimize gas delivery and RF distribution, resulting in industry-leading throughput and defect control. Figure 2 shows atomic force microscope (AFM) images of ultra-smooth VECTOR Strata films, showing film roughness that is comparable to the underlying substrate. 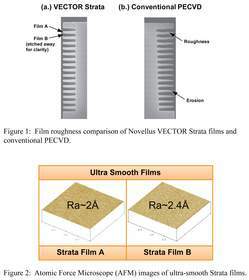 "VECTOR Strata deposits the low defect, ultra-smooth films required for next generation 3D NAND flash memory designs," said Sesha Varadarajan, senior vice president of Novellus' PECVD Business Unit. "VECTOR Strata has been adopted by leading memory manufacturers as the VIM development tool of choice due to its industry-leading advanced technology and multi-station sequential processing productivity." For more information about the new VECTOR Strata, please visit www.novellustechnews.com. The multi-station sequential processing (MSSP) architecture of Novellus' VECTOR platform allows for independent temperature and flow control to its deposition stations, a critical requirement to meet the integration needs of sub-3xnm technology nodes. More than 1,000 VECTOR systems have been installed in logic, memory, and foundry fabs around the world. About this company Novellus Systems, Inc.